Through the Looking Glass: Who can be amazed, inspired, sad, excited, enlightened or moved to tears in just one day? Who can be amazed, inspired, sad, excited, enlightened or moved to tears in just one day? Loyal and neutral, in a moment? No man." Who can be amazed, inspired, entertained, enlightened, frightened, moved,saddened, moved to tears, hopeful and have their hearts and minds filled to bursting point?The answer is no man or no woman - actually any man, woman or child who attended TEDxChristchurch on Saturday 1st November at the Aurora Centre for the Performing Arts at Burnside High School Christchurch. I have been a fan of TED talks for a long time. I have shown my students wonderful talks from amazing people and actually find it impossible to believe that not all teachers are doing this as well! In fact one of the highlights for me this year was going to the Eductech Conference in Brisbane and seeing Sir Ken Robinson speak on stage. 29 million people (including me) have seen his TED talk about creativity, so it was fantastic to hear him speak about this subject and more in June. The other amazing speaker was Sugata Mitra of the "hole in the wall" experiment where children demonstrated their ability to teach themselves. 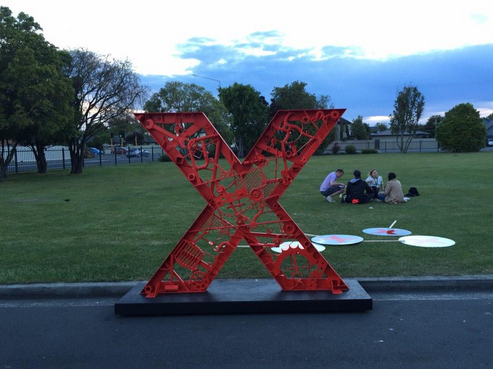 So, TEDxChristchurch was my opportunity to experience, firsthand the "magic of TED". And I was not disappointed. In fact I thought my brain would explode! And as I obviously enjoy near-death experiences of possible brain explosion, I shall be signing up for next year. I find it difficult at this type of event to take notes any more coherent than what appears to be the ramblings of a madwoman. I can only manage a few tweets. Luckily my good friend @annekenn live blogged the whole event for me. Thanks Anne. She also followed up by meeting several of the speakers and several of us were also lucky enough to meet them. What a humbling experience to meet Thomas Petschner and Tariq Habibyar, as well as sharing the joy and wonderment created by Mark Gee and his amazing moon silhouette. and get on their mailing list so you too can experience "the magic of TED"
Form a queue behind me! Oh Pauline, You have captured the feelings of the day so well. I am still finding it hard to comprehend the journey we went on in a single day! My usual word seems so inadequate... but MAGIC it was! I am still reflecting on my highlights and my challenges to take forward! The actions out of this are so very real and necessary. I blogged about the experience on the flight home until the bumps prevented me holding onto my laptop! I have just posted my reflection and look forward to many more wonderful discussions to come! Thanks for including me in your post and thanks for responding to my naggings to sign up!!!! Fantastic, Pauline. So pleased you had such an amazing day. I went to tedxchch in May, 2011....you can probably imagine how emotional that was. It was an amazing day; we were all still reeling and the inspiration of an event like that in the midst of such sadness was an experience I'll never forget. Agreed! An amazing experience that is hard to explain to those who weren't there...I'll certainly be queueing for the next one!